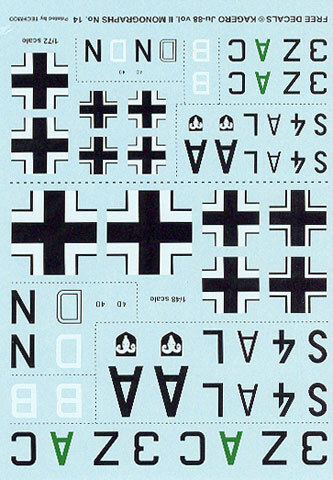 Advantages: Bi-lingual text; decal sheet included for 1/72 and 1/48 scale models; good coverage of the Ju 88A and D in service; includes attractive colour profiles; lots of plans in 1/72 and 1/48 for all variants of the Ju 88A, D, H, P, S and T; very helpful progressive variant diagrams. 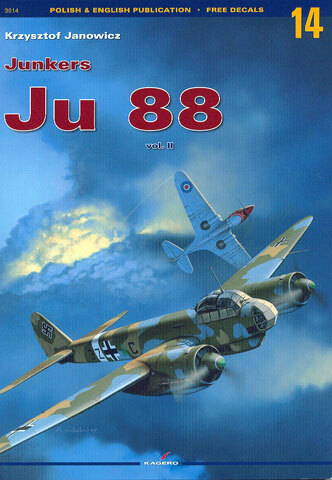 Kagero continues its coverage of arguably the best German medium bomber of WWII with their latest Monograph publication, Junkers Ju 88 Vol.II. This volume covers the operational story of the Junkers Ju 88A and D variants in Luftwaffe and foreign service, and also provides a bonanza for modellers with a comprehensive section of plans. The book is presented in typical Kagero style. This A4 sized title has 138 pages printed on glossy paper between cardboard covers, plus several A3 fold out pages with 1/48 scale plans. The left hand column of each page in the history section is printed in Polish and the right hand column in English. The captions and colour artwork receive a similar approach with the Polish language first followed by the English translation. 28 pages of the book are devoted to technical drawings. There are 1/48 and 1/72 scale drawings supplemented with scrap views detailing specific parts of interest of the airframe plus ordnance. These are all very well done. In addition to these, though, Kagero includes a series of drawings that point out the incremental differences between Ju 88 variants. The distinguishing factors are illustrated with shading and also described in accompanying text. Kagero has been employing this feature for a while now, and I think that it is one of the real benefits of the "Monographs" series..
Four big A3 foldout pages of attractive colour profiles, plus more profiles on the inside front and both sides of the back cover, round out this publication. Markings are offered for four different aircraft in both scales, including a couple of very interesting "squiggle" pattern schemes and, my personal favourite, a Ju 88A-4 with soft clouds of 76 and 79 sprayed over its standard RLM 70/71 upper surfaces. Modellers are well served with the Ju 88 in 1/48 scale via Dragon's quite comprehensive family of kits. In 1/72 scale, things are not quite so bright, but there is always the AMtech Ju 88S, T and H kits. We can live in hope for a true state-of-the-art Ju 88A and D someday soon. Regardless of what brand or scale you are building, though, Kagero's Monograph continues to be a very useful format for modellers. This is an excellent one-stop modellers' reference source on the Junkers Ju 88A and D, with some useful supplementary material on the H, P, S and T variants too.